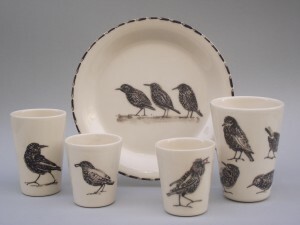 Corien has created many works in association with other artists, illustrators and designers. 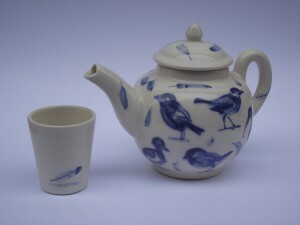 She frequently works with Gerda van Kersbergen, with whom she produces a variety of tableware, including tea sets, gift sets, dinner service and individual pieces of crockery. 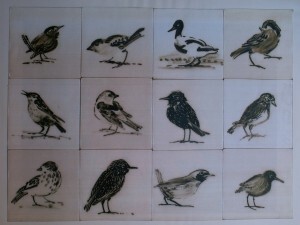 Together they also create many commissioned works. 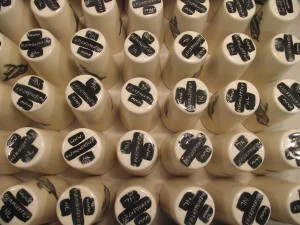 A notable recent client is ´A Curious Group of Hotels´. 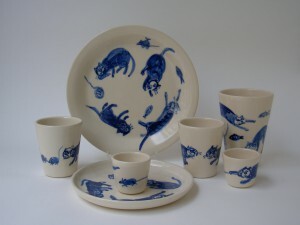 Corien also collaborates with illustrater Anki Posthumus. 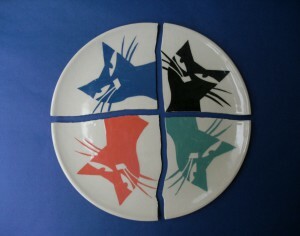 The decorations that Anki applies are done in engobe (a fluid form of clay) using stencils, although she sometimes applies painting and carving technique to her engobe designs. 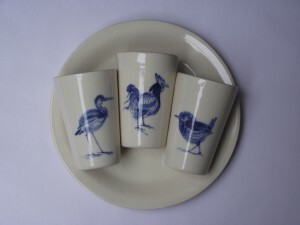 Corien creates complete “high-fired” dinnerware sets and other tableware items. 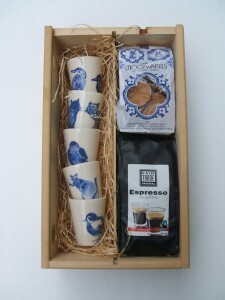 These are decorated with Gerda van Kersbergen’s cheerful designs and illustrations. 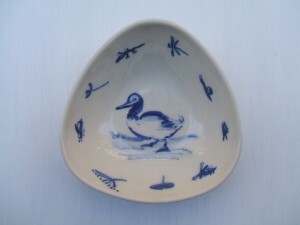 Gerda’s work is inspired by our small friends in the natural world. 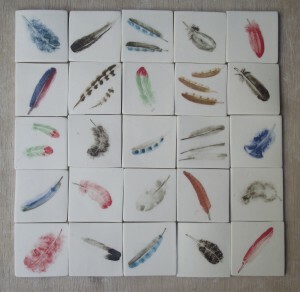 Her colorful designs often use birds, insects, cats, feathers etc. 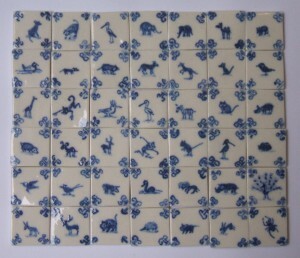 as a motif. 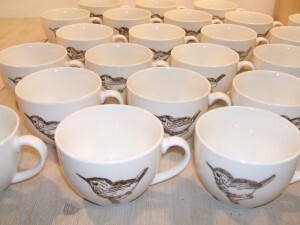 A significant commission for an entire group of hotels began with small soap dish: tiles that Gerda van Kersbergen had decorated with a meadow pipit. 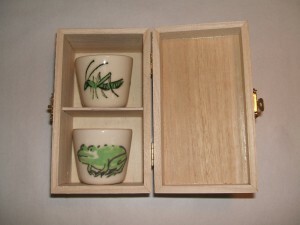 Once these were delivered a follow-up commission added a toothbrush mug to the growing series. 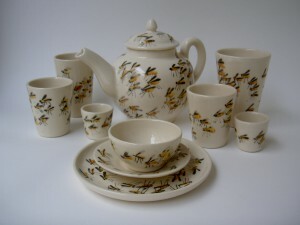 The latest order for ‘A Curious Group of Hotels’ was for a cup and saucer set. Together, Corien and Gerda have created several commissioned works. 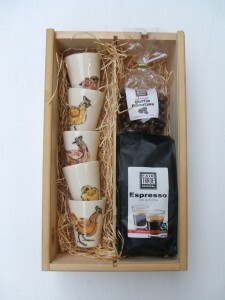 Here are some examples of gift sets. 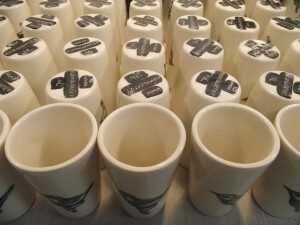 The small cups with the cheerful decorations are used by customers for multiple purposes, including espresso cups and egg cups. They are even in service in a tea garden in Japan under the cherry blossoms. 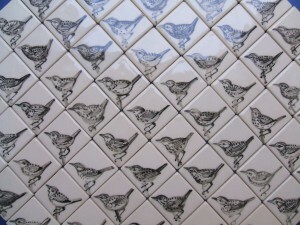 Corien also produces unique ceramic tiles in collaboration with Gerda. 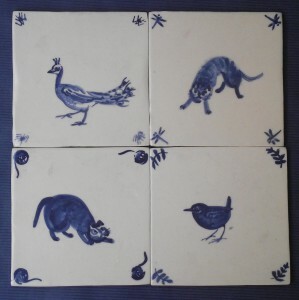 Examples of tiles made on commission include many decorative and commemorative tiles: durable, functional pieces that are now even cheering up kitchens and bathrooms around the world. 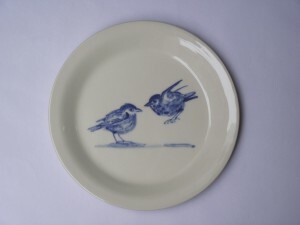 Here is an example of plates made by Corien in co-operation with Anki Posthumus. 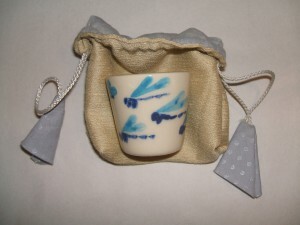 They are made of liquid clay that is cast and then high-fired. 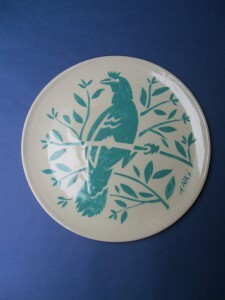 The decorations above are made with stencils and engobe. 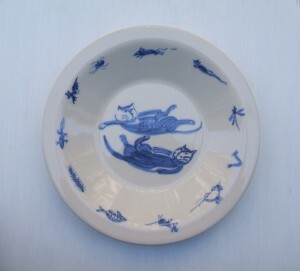 The cat plates consist of four separate plates on little stands.